What does an ELO program look like? ELOs can be available to students for varying amounts of credit – from a multi-disciplinary, multi-credit opportunity to a focused one targeting specific competencies as part of a traditional classroom course. Different schools in NH have varying policies around ELOs and are also at different points of implementation within those policies. There are tools available to help you develop your program. The New Hampshire Extended Learning Opportunity Handbook (PDF, 311 pages, 2016) is a comprehensive manual by Sheila Ward, Bonnie Robinson and Doug Cullen. It covers all aspects of ELO program development and implementation – a rich resource! The ELO Program Development Process Chart (PDF, 5 pages) is a planning tool shared by Sheila Ward and Pittsfield High School. It leads you through the important questions and decisions. Winnacunnet High School ELO Program in Hampton, NH. Winnacunnet’s program was featured by the New England Secondary School Consortium. ELO Handbook for students, teacher mentors and community partners, from Central Falls High School in Rhode Island. Very similar to NH ELOs. Who are your allies in starting ELOs? What’s going to get in your way? What are the barriers? What is your school/district policy about ELOs? Who needs to be on board? How will you explain and promote your ELO to students and faculty? Download a brochure your school can use to introduce parents to ELOs. It’s a PDF with an editable space on the front to add your school’s information. 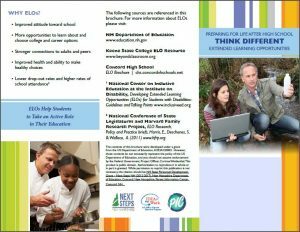 Reaching Higher NH, a non-partisan public education policy resource, has promotional videos, articles and brochures on ELOs. The SW Center at Keene State College can arrange customized workshops or graduate courses to assist your school’s implementation of ELOs. What is the context for ELO implementation? How are ELOs developed and implemented? Who is served by ELOs? What are the characteristics of ELOs? How are ELOs assessed for credit? What is the quality of ELOs? What are the Initiative’s effects and short-term outcomes? What have we learned about supporting ELO implmentation, impact and sustainability? An ELO Coordinator is central to ELO system development, implementation and quality assurance. There is fluidity in the roles of ELO coordinator, community partner and overseeing educator. School have adopted different models for implementation, particularly regarding the role and time for teachers to support ELOs. Who is eligible to do ELOs? When schools decide to pilot ELOs, it is important to include diverse populations from the beginning.